With 16-foot (5-m) strides, an ostrich can run as fast as 43 miles an hour (70 kph), changing direction by using its seemingly useless wings as rudders. The long claws on this flightless bird’s feet turn its legs into weapons that can kick and stab a lion to death. What does an ostrich use its wings for? Males use their wings in elaborate courtship dances. Wings act as rudders when an ostrich runs. 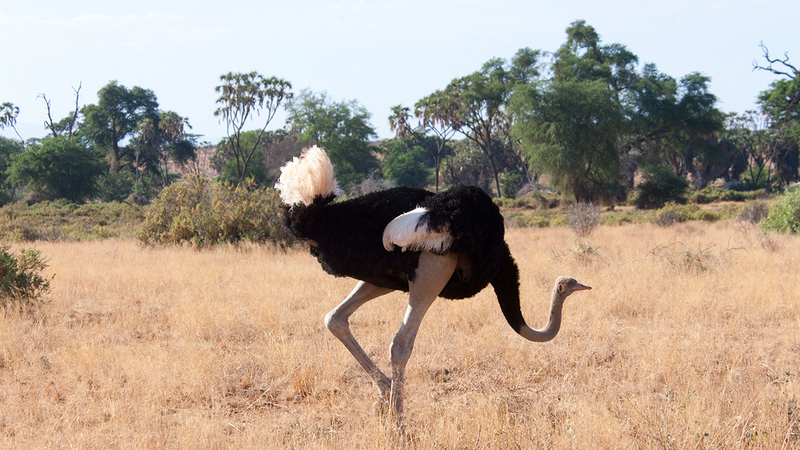 Ostriches can actually fly, albeit only for very short distances very close to the ground. Ostriches are champion runners, reach speeds of up to 43 miles and hour (70 kph). At high speed, they can use their wings as rudders to help them change direction. 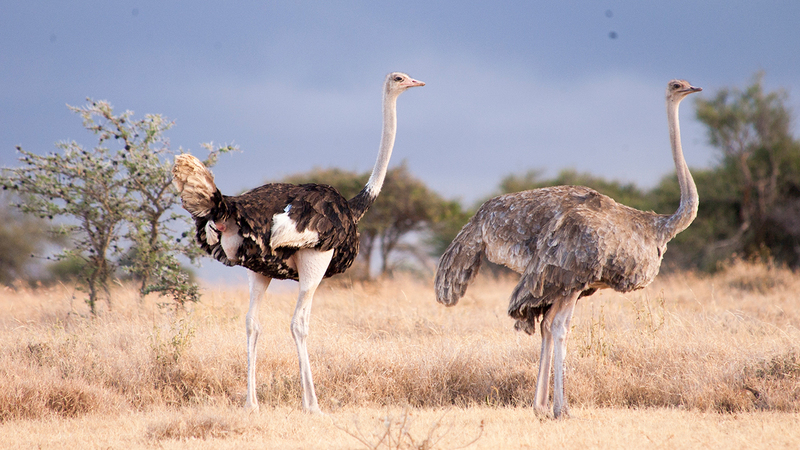 ​Ostriches live in herds of no more than 12 birds. Each herd has a dominant male and female. 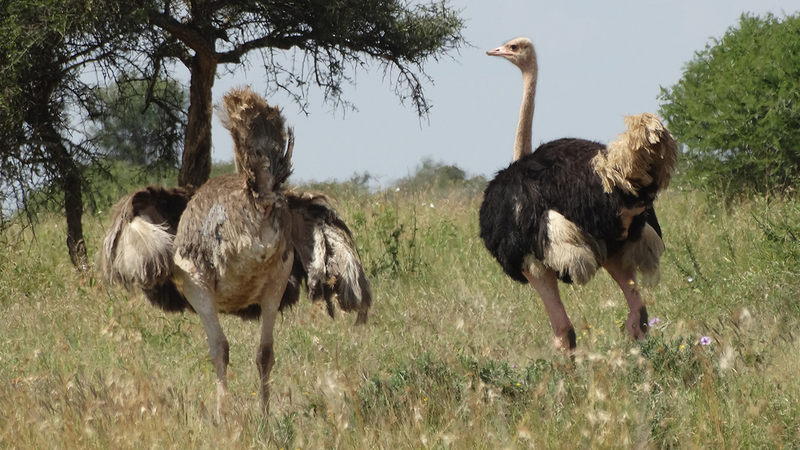 Ostriches often congregate with herbivores to the mutual benefit of both groups: The grazing herbivores stir up insects, and the long-necked ostriches warn of approaching predators. Ostriches are omnivorous. They eat plants, roots, seeds, insects, lizards, and whatever else they can find in their harsh, dry habitat. The toothless birds swallow pebbles with their food to help the gizzard—a muscular part of the stomach—grind up the food so it can be digested. An alpha male maintains his herd and mates with the herd’s dominant hen. But sometimes the alpha male mates with lesser hens, as may some other males. All the hens put their eggs in the nest of the dominant hen. 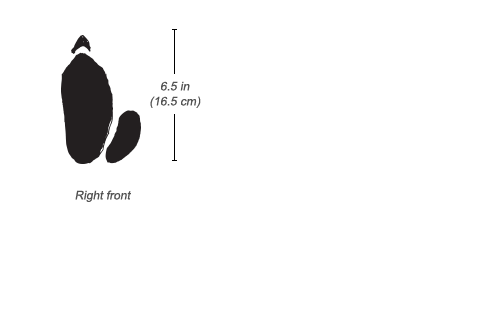 She and the alpha male take turns incubating the eggs, each of which can weigh as much as three pounds (1.4 kg). The eggs incubate for 35 to 45 days. The chicks can run as soon as they hatch. Ostriches are preyed upon by cheetahs, lions, leopards, spotted hyenas, and humans. 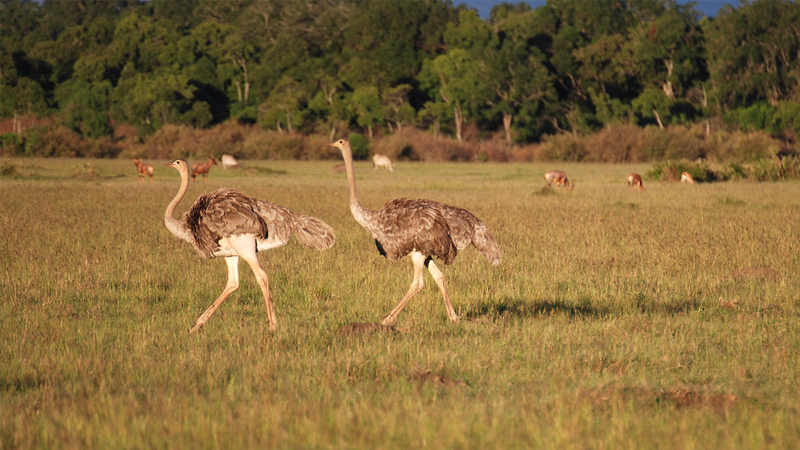 Ostriches inhabit much of Kenya in savanna, bush, and scrub. 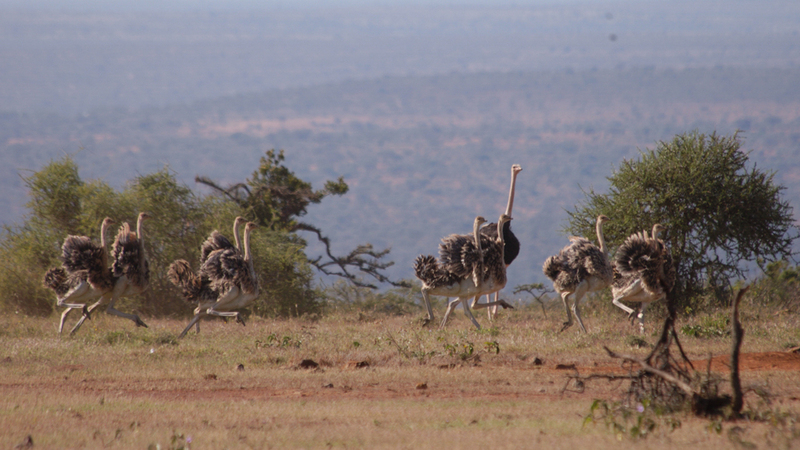 Ostriches live throughout Africa on semiarid plains and woodlands. Ostriches do not bury their heads in the sand. They react to danger by ducking, dropping their long necks to the ground. 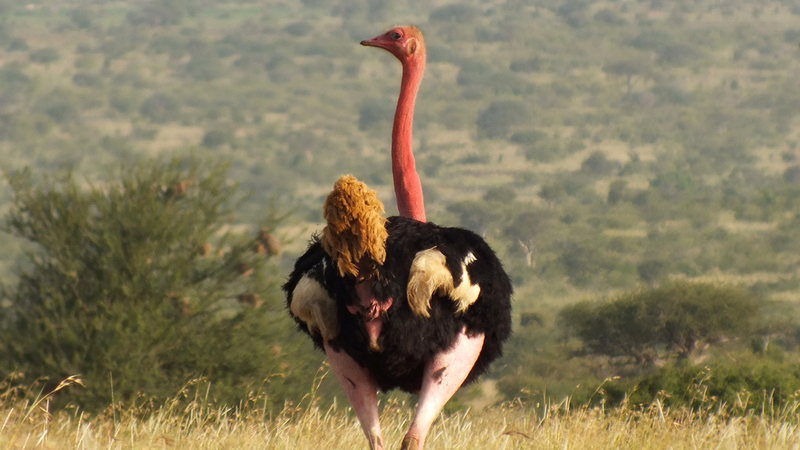 From a distance, this looks like the ostrich is burying its head.